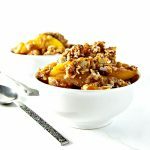 This Gluten-Free Peach Crisp is easy to prepare and is ready in under one hour! Comes with an optional paleo version. Set the oven to 375 degrees. Partially the peaches. To do this, I typically thaw them for about half the time as would be needed to completely thaw them. Pour them, along with any juice, into an 8×8 baking dish. Sprinkle 1 tablespoon coconut sugar on the peaches in the dish and gently stir stir to combine the ingredients. In a separate bowl, combine the remaining coconut sugar with the gluten-free oats, almond flour, cinnamon, and shredded coconut. Cut in coconut oil with the dry mixture. I like using a potato masher to cut in the coconut oil, but two butter knives will also work. Pour the dry mixture over the peaches. Bake for approximately 35 minutes or until the peaches are soft and the topping is crispy but not burned. For larger peaches, you may need to cook longer. For a paleo version, add 1/2 cup shredded coconut to the topping, replacing the gluten-free oats, along with another 2 tablespoons shredded coconut, as originally planned in the recipe.